Selling your house at auction is becoming more popular and favourable for those who wish to achieve a quick house sale. We have collated the important information that you need to be aware of when considering selling your property at auction. Selling at auction isn’t for the faint hearted, so it’s important that you have all the insight you need to manage your sale successfully. An auction is the process of buying and selling goods, or services, by offering them for bidding. Bids are taken, and the items are sold to the whoever bids the highest amount. Auctions are commonly opened with an ascending price, and bidders bid openly against one another, with each subsequent bid required to be higher than the previous. Auctions are common for the quick sale of a wide range of goods, including cars, antiques, livestock and property. How do you sell your house at an auction? To purchase the property the bidder has to put a 10% deposit down to secure the sale. The sale will then be completed within a month, when the remaining 90% of the funds are transferred. Homeowners who are generally looking for a quick house sale, and more importantly certainty of a sale, often find that selling their property at auction can be a good solution. As soon as the hammer falls, the buyer is obligated to purchase the property (property sold at an auction goes under offer when the hammer strikes), and has to put a 10% deposit down to secure the sale. The sale will then be completed within a month, when the remaining 90% of the funds are transferred. Selling property at auction can create a plethora of interest from a number of potential buyers which can soon drive up the price, especially when the auction room is full of property buyers who don’t want to miss out on an opportunity to buy property quickly, and below market value. Auction selling often requires a particular type of property. If you have an unusual or dilapidated property, you may find it difficult to advertise to traditional house buyers. Auctions do however attract a different variety of property buyers, such as developers and experience landlords with different needs and requirements, who aren’t put off with problematic properties. If you’re looking to sell your house fast, auctions are an ideal option for you. Providing there is enough interest in the auction rooms, and you set a realistic reserve on your property (generally 75-80% of the market value), your property will sell quickly at an auction. Selling a house at auction can cost up to £1200 plus VAT for a solicitor, with 2.5% of the house value on top of that for the auctioneer fee. Selling property at auction is not a cheap process, and is considered one of the most expensive routes when you need to achieve a fast house sale. Generally, there are no hidden costs, however homeowners should expect to pay the auctioneer in the region of 2.5% of the sale price. One factor to consider is that even if your property doesn’t sell, you are still liable to pay the auctioneer fees. It is also advisable to check with the auction house if there are advertising costs when selling, as this may be an additional cost to consider. Another cost to consider is the solicitor fees. Solicitors commonly need to prepare a legal pack, which potential buyers will review prior to making an offer. 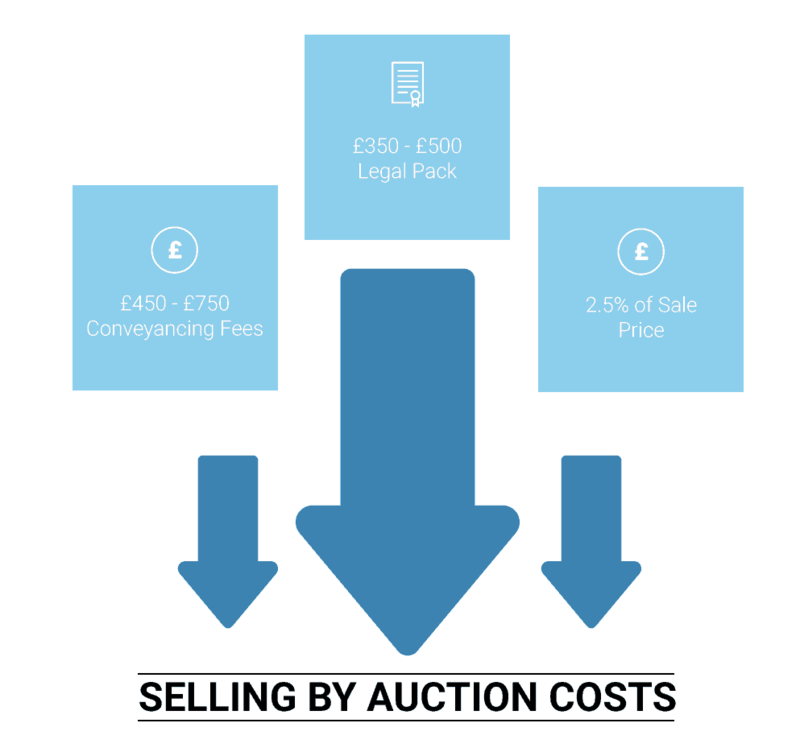 The fees for legal packs can differ depending on the solicitor, but they generally cost around £350-£500 to produce. The pack will include things such as the title plan, lease information (if required) and any other valuable information which is required to formulate an offer on a property. On the day of the auction, once the auctioneers hammer is hit and an offer is accepted, this is now legally binding. You will then be required to pay an additional fee to your solicitor for the conveyancing to get the property sale completed with the buyer. Conveyancing fees differ throughout the country, but usually range between £450-£750 plus VAT, depending on the sale price of the property. So, to summarise, selling a house at auction can cost up to £1200 plus VAT for a solicitor, with 2.5% of the house value on top of that for the auctioneer fee. Which auction house should I use to sell my property? We recommend that you go with one of the larger and more established auction houses, as the generally have the largest databases of property buyers. Selling at auction is no longer a simple procedure, as there are so many auctioneers in the UK. If you need to sell your house quickly at auction, but are confused by which auction or auctioneer you should use, we recommend that you decide on an auctioneer that specialises in what you’re selling. Some estate agents have specialist auction divisions, and it is these types of auctioneers who will have a greater understanding of the market, and a better chance of achieving a higher price for your property. Some of the larger and better auctioneer houses in the UK have been featured in a fantastic article from The Telegraph, which gives a comprehensive breakdown of the top 20 auction houses in the UK. The costs, reputations and procedures for most auction houses differ in their own ways. It is worth doing some research if you’re considering selling your home through an auction house, and review some auction house catalogues to check the standards and presentation of available properties. Selling your house at auction is never guaranteed, and even if the property doesn’t sell, you will still need to pay the professional fees. To give yourself the best chance at selling your property at auction, Good Move recommended that you go with one of the larger and more established auction houses, as the generally have the largest databases of property buyers. Should I accept offers in advance of the auction? We suggest letting interested parties fight it out on the day with other buyers. When you are preparing your property for auction, your property will be marketed to a large number of buyers via the auction catalogue, and a number of viewing days will be arranged before the auction date. Prior to the auction, it is perfectly normal for homeowners to receive offers on their property through the auction house. It is the homeowner’s decision as to whether they will take the offer or risk going to auction, with the uncertainty that the property may not sell. Each individual position is different when selling your property at auction. Some homeowners need the money quicker than others and some can afford to wait. Here at Good Move, our surveyors always recommend that if you have already gone to the expense of paying auction and solicitor fees, you may as well wait for the auction instead of accepting an offer pre-auction (if you can afford to). The thought process behind this, is that if there is a strong interest for your property prior to the auction, then this interest usually will stay until the day of the auction. Therefore, we suggest letting interested parties fight it out on the day with other buyers. This will usually help you achieve the best price by creating competition. How do I set the reserve and guide price at auction? Set a reserve price to stimulate interest in the auction room. Let the auctioneer set the guide price. Prior to the auction day, you will need to make a decision regarding the reserve and guide price. The reserve price is the minimum price you are prepared to accept on your property once the bidding process starts. It is important to have a reserve price, but it’s imperative that you set this at a realistic level. As you have chosen to sell your house quickly at auction, our recommendation would be to set a reserve price to stimulate interest in the auction room. It’s worth remembering that even if your property doesn’t sell, you will still be liable to pay the auction and solicitor fees. 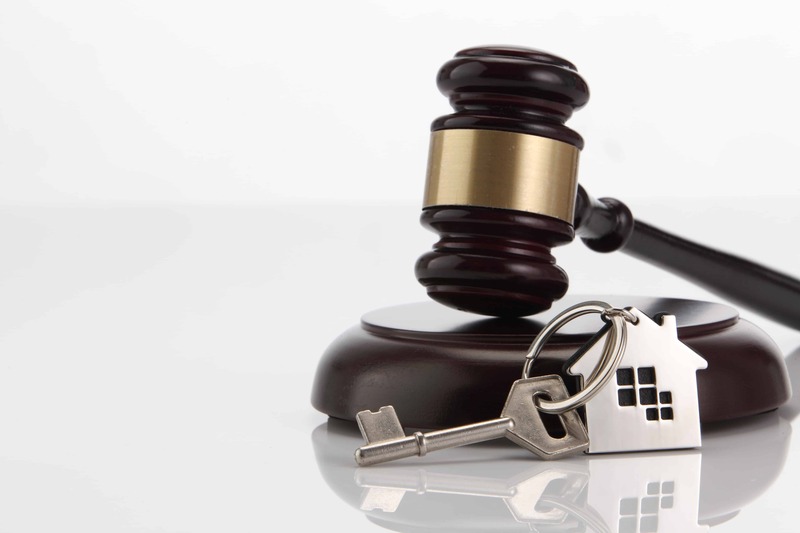 The key to performing well at auctions is to pitch the reserve price just right., and once the reserve price has been reached, you are now legally bound to sell. The guide price is also another issue that has to be considered. This decision is usually left to the auctioneer, to get the bidding process started. The auctioneer will use his/her skills to position the guide price just right, so that is entices property buyers to start bidding. What else should I consider prior to the auction? We recommend that you put some time into presenting your property in the best possible light for the open days, prior to the auction. Homeowners often ask us if there is anything that they can do to help make a sale at auction. On most occasions, if you instruct a good auction house, things should go well, but it’s just as important that you take matters into your own hands. Unless the right kind of buyers are in the auction room on the day, your property might not sell. We recommend that you put some time into presenting your property in the best possible light for the open days, prior to the auction. This could be done by giving your property a deep clean, buying fresh flowers, or giving your property some great kerb appeal with the likes of hanging baskets and landscaped/manicured gardens. In addition to making your property shine, the way we market our properties is changing at an alarming rate. Social media has a big impact on how we go about our everyday life, and now people keep up-to-date with news and information through Facebook, Twitter, LinkedIn and so on. If you are selling your house at auction, make sure that you share your property advert in the auction catalogue, through your social media channels. This can help generate more interest around your property. This also applies to property buyers, as buyers can also now log into the auction room and make proxy bids. This means that bids don’t just come from the auction room itself, but also from telephones and computers. Hopefully your property will sell fast at auction, however if it doesn’t sell on the day, there is still the option of trying to sell after the auction, if you are prepared to sell at less than your reserve price. How long does it take to sell at Auction? If exercised correctly, selling at auction can be a quick process and you could sell your property within two months. Typically, it takes anywhere from 6 to 10 weeks. As with any selling medium, selling at auction has it’s pros and cons. If exercised correctly, selling at auction can be a quick process and you could sell your property within two months. It can often be the case that when you don’t sell your property at auction, this can often put the homeowner in a precarious position, because it can be seen as an “unwanted” property on portals such as Rightmove and Zoopla. One of the new approaches to get a guaranteed sale, is through regulated property buying companies such as Good Move. We are a surveying firm, which operates in the Quick House Sale Industry, and are regulated by the RICS (Royal Institution of Chartered Surveyors) and the NAPD (National Association of Property Buyers). We purchase properties anywhere in England and Wales, regardless of its condition. We can buy your property within two weeks, and we will generally pay between 80-85% of the market value. You won’t have to worry about legal fees, as these are paid by us, and you also have no estate agency fees to pay.